Winter is on its way, bringing with it snow, sleigh bells, and a renewed importance around being safe in our homes and communities. To prepare, we’re putting snow tires on our cars, pulling winter boots out of storage, and stocking up on salt for our sidewalks and driveways – but for people with dementia, those safety steps go a bit further. If you’re living with dementia or helping to care for someone with dementia, here are some important factors to maintain safety in your community through the winter. Proper clothing is one of our first levels of protection in inclement weather – so be sure to pull the sweaters, winter coats, boots, hats, scarves, and mitts out of storage so that season-appropriate clothing is close at hand. Footwear considerations are extremely important – find boots with good grip, that are well-insulated, and with velcro instead of laces for ease. For those items like hats and mitts that seem to disappear, purchase a few extras so that you’re never without. It’s a good idea to buy clothing items that are brightly coloured or distinctive in some way – if someone with dementia gets lost, it will help as an identifying marker. If you see someone in the community this winter who isn’t dressed properly for the weather, they may need assistance. 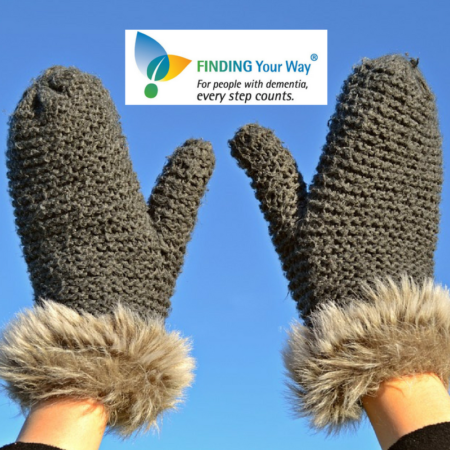 Visit our Finding Your WayⓇ website to learn how to help someone with dementia who may be lost. Sundowning refers to the time period – usually later in the day – when confusion and agitation increase for people with dementia. With less sunlight and shorter days during the winter months, sundowning can be exacerbated, but there are ways to help ward it off. Keep curtains open as much as possible during the day to let in sunlight. Turn lights on in the home earlier in the evening, and consider purchasing a special light box to provide specialized light therapy. If applicable, ensure that outdoor walkways around the home are well-lit, and consider adding motion-detected lights outside. Remember that people with dementia often have issues with visual perception, so helping to keep homes well-lit indoors and out is extremely important. These tips are just some of the ways that people with dementia can remain safe and active during the winter months. Don’t forget to consider the use of locating technologies – a cell phone, door sensor, or GPS tracker may be helpful to avoid a wandering incident or to help find someone who has gone missing. Want to learn more? Visit the updated Finding Your WayⓇ technology page! Winter is a beautiful season, and meant to be enjoyed – so be safe, and have fun!